Please join me and about 4000+ other technology professionals for the annual PASS Summit in Seattle, WA October 24th – 28th. But before I talk about this year’s event, join me in a trip down memory lane about my path to the PASS Summit. If not, skip to the end of this blog. 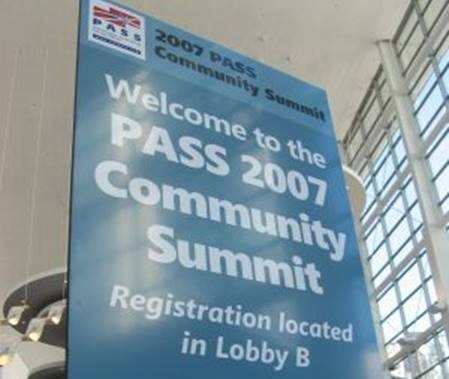 My first trip to the PASS Summit was in 2007 or 2008 in Denver, CO. I saw the advertisement on SQLServerCentral.com with names of speakers that had written articles I was familiar with. To think I would get to learn from these speakers and get out of the office for a week seemed only a dream. But, it became a reality. My boss actually wanted to attend as well which started a training fund for the IT department. SQLServerCentral.com had a code that would give you a discount for the event as well as entry to the then famous Reception Party and Casino Night with prizes. Man that used to be fun. Opportunities at work guide us to the sessions to attend. First, we wanted to know more about clusters since we had two different physical clusters that had some problems with failing over and restarting. There were many databases to manage, but two in particular were 500+ GBs (on SQL Server 2005) and growing fast. A indexing and rebuild versus reorg session grab our attention. The last objective was to see what DataDude was all about. This was the first version of a database project in visual studio. I think Grant Fritchey did this talk. There was also a Database Normalization talk given by Louis Davidson and Paul Nielsen (really miss Paul’s talks at PASS). Of course, since Microsoft was going to be present at the event, we had to spend time talking to the support team about problems with SQL Server. A vender, Scalability Experts, had a booth and two of the speakers had help us with an upgrade from SQL Server 2000 to 2005. Does anyone even remember those wonderful times? After our second journey to the Summit the following year, I started thinking that I could do some of these talks because I had learned just as much as they were teaching. This started me on speaking at Lunch and Learns at work followed by the Baton Rouge SQL Server User Group (Thanks Patrick LeBlanc). I think I actually spoke at the .Net User Group first. I also started going into LSU with AITP to teach subjects about databases as well as career sessions to show graduates the different technology companies in and around Baton Rouge. Since then, I have had the privilege to speak many times through the years on many topics I use day to day at work. Most tedious has been the volunteer work with the Abstract Review and PowerPoint Review committees over the past 6 years as well as helping the Performance, Data Architect and Excel BI Virtual Chapters. This has enable me to get out of my shell and interact with the larger Professional Association of SQL Server user community (oops! Now the Microsoft Data Technology community). This has led me to being selected this year to speak at the PASS Summit 2016 in Seattle, WA. I am really going to enjoy sharing the stage with Bill Anton for a SSAS Performance Improvement session. If you have not started reading Bill’s blog, please start. He is a smart dude with some great experience and enthusiasm with Analysis Services. So, all this was given from me to you to invite you to the PASS Summit. It does not matter why you come: Sessions, SQLCAT, Networking, Speaking (future speaker), Vender parties, SQLKaraoke or just a break from work. Make the trip, get involved and help change or mold the Microsoft Data Technology community into what we need to help others adopt to the new features or tune the old skills.